All terrain strollers are very popular with the increase in health and fitness. Moms and dads are looking for strollers that can handle trails, sand, gravel and other surfaces easily. We’ve gathered the top rated all terrain strollers on the market for you to take a look at and to see which one is perfect for your needs. The design of these versatile strollers allows them to go almost anywhere you want to go on any kind of surface including gravel roads, sandy beaches and sidewalks to just taking a stroll through the mall. One of the features that make these strollers able to travel on any type of surface is the front locking swivel wheel that aides in these terrains. 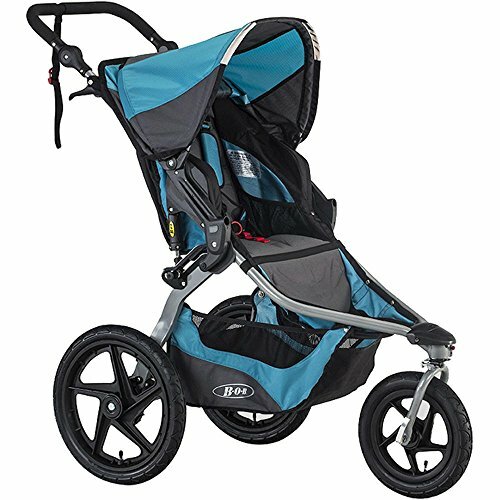 Jogging strollers usually have larger wheels, measuring 12” to 16” but an all terrain stroller has much smaller wheels, usually measuring 8” to 12”. If you are going to be jogging, you may be better off with a jogging stroller that has this swivel/locking front wheel, which is designed for that type of activity. The all terrain stroller is great for walkers and hikers too. There are many features that this all terrain BOB Revolution Flex Stroller has that make it the top pick for all terrain strollers. We’ll start with the state of the art adjustable suspension system that provides users with a smooth ride that is incomparable. The swiveling front wheel provides plenty of maneuverability and can be locked in the forward position to stabilize the stroller when jogging or navigating tough terrain. The adjustable padded handlebar has 9 position options making it suitable for parents of any height to push comfortably. It has an easy, two-step folding feature that makes storage and travel much easier. In addition, the lightweight frame makes it easy to handle as well. The adjustable, reclining seat is enhanced for the child’s comfort and is ultra padded and has a 5 point padded harness to keep your child secure and safe while you are jogging or on your walks. It is good for babies 8 weeks of age and up. If you are going to be jogging with the stroller or using if for off road use, it is recommended that the child be at least 8 months old due to the jostling that might occur. Children up to 70 pounds can ride safely in this BOB Flex all terrain stroller. 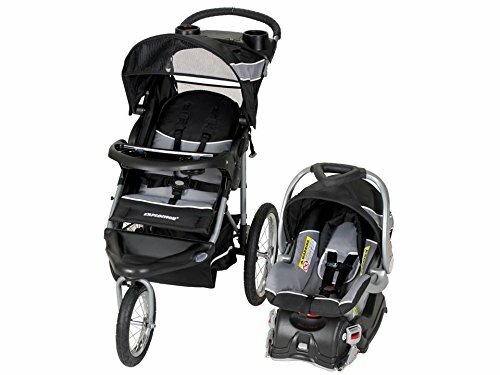 One of the great features of this all terrain stroller is that with the addition of a Britax adapter that is sold separately and an infant car seat you can have an all terrain travel system that will go from home to car to stroller. You can also attach a snack tray to the stroller so the child can have a snack if they get hungry while you are on your walk. The Schwinn Turismo Swivel Single Jogger has wide tires with great tread that is easily able to handle rough terrain such as sand, gravel, dirt paths, sidewalks and more. The front wheel swivels, measuring 12” in diameter and can be locked into place in the forward position which provide stability and more control. The 16” rear wheels make pushing the stroller almost effortless. The lightweight aluminum frame is durable and long lasting. The folding mechanism is a dual trigger system that adds a safety element to the stroller as well. This all terrain Schwinn stroller comes with a molded, flip open child tray that has two cup holders and the molded parent tray has dual fin grip cup holders. Another great feature of this all terrain stroller is the canopy mounted speakers that accept the majority of MP3 players and the car seat adapter allows you to use it with many car seat brands. The handle of the stroller is very comfortable and made of rubberized and adjustable as well as slip resistant. Your child can ride in the stroller until they are 50 pounds or above. The canopy has a viewing window and sun visor and is retractable as well to protect the child from the sun. The under-the-seat basket is a convenient place to carry the parents’ belongings or a diaper bag. When you need to park the stroller, it has individual rear brake pedals for the ultimate in safety. 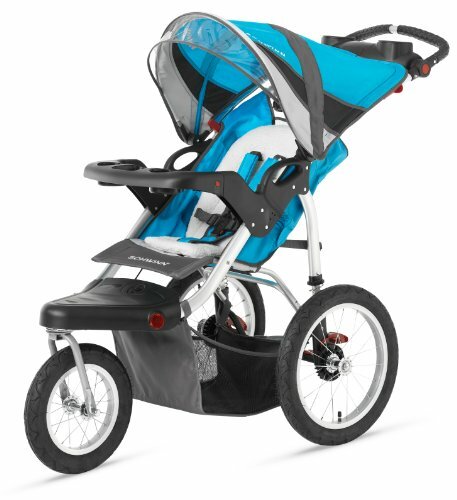 Another great all-terrain stroller choice is the Baby Trend Expedition Jogger Travel System. Included in this system is the Baby Trend 3 wheel jogging stroller and the Flex Lock 5-30 pound infant car seat. This car seat has a lock in car base as well. Take this from home to the car to the stroller effortlessly which makes it much easier on both the baby and the parent when you have to run errands or travel. The front wheel swivels and can also be locked in place which makes it great for jogging and taking walks or hikes on rough terrain of all kinds. Another feature is the quick release wheels that make it extra compact for travel or storage. The parent tray holds two drinks and has covered storage and the convenient child tray holds a child’s snack or cup. There is also a storage basket underneath for diaper bags or the parent’s belongings. The extra wide, foam padded handle has a comfortable to hold ergonomic design. This convenient travel system can hold a child up to 50 pounds and the car seat works for weights of 5 to 30 pounds. There is a 5 point harness that keeps the child safe during travels and a multi-position reclining seat that provides different seating positions. The seat is fully padded for extra comfort. The one hand harness adjustment and push button release also has a 4 position push button height adjustable base that makes taking the baby in and out of the car super easy and non-intrusive if the baby is sleeping. Another feature of this travel system is the EPS energy-absorbing foam that provides side impact head protection while riding in the car. The large carrying handle makes it easy to transfer the car seat from the vehicle to the all terrain stroller. An all terrain stroller is designed to go in areas that traditional, regular strollers can’t go. These places include gravel roads, dirt roads, uneven sidewalks, sandy beaches, and more. Some all terrain strollers are not as good being heavily used. These top rated choices that we have brought you are all top of the line and offer plenty of features. If you want to learn more about all terrain strollers, read the buyer’s guide below. We’ll provide everything you need to know about all terrain strollers so you can start to narrow down the choices. What is an All Terrain Stroller? All terrain strollers are terrific for todays on the go parents. They allow you to take the baby with you anywhere, even if it’s walking on a dirt path or taking a stroll along a sandy beach. There are many different factors that make up a great all terrain stroller. These are the points and features you want to look for and compare when you start shopping around. The top rated models we have shared with you are the best of the best for many reasons. They provide the parents with a safe, durable, all terrain stroller that they will have for a long time. Below we have outlined all of the most common features and points that you will want to consider in your own search. Ease of use – You want to look for an all terrain stroller that folds and unfolds easily. You also want to look for ease of use for adjusting the harness and the backrest as well. Make sure the storage basket is easy to access, look for brakes that are easily accessible and engaged and if it is a travel system, make sure that attaching and detaching the infant car seat is smooth and efficient. Another factor that is good to look at is how heavy it is to move. An all terrain stroller that is hard to carry with one person is not going to be very practical when you have load and unload it by yourself. Maneuverability – The whole purpose of an all terrain stroller is that it can handle different types of surfaces. You want to be sure that you can easily push the stroller up and downhill, over grass, sand, asphalt, gravel, and other surfaces. You also want to be sure that it is easy to turn and move in tight areas. Safety – When it comes to children and children’s products, safety is always one of the most important factors to look at. You want to be sure that it meets the required specifications and that there has been no recalls on anything. Safety features include good, easily reaches brakes that are easy to engage, a 5 point harness, canopy and sunshade, and if it is part of a travel system, look for the infant seat to have the side head impact protection. A 5 point harness is much safer for the child than a 3 point. A 3 point harness only secures the upper body of the child who can slide out underneath the restraint if you are not watching. Construction – Durability is important when buying an all terrain stroller. The money spent on a good quality all terrain stroller is not money you want to just toss away. Making sure the construction of the stroller is sound and that good materials are used is important to the longevity of the stroller. You want to look for things like lightweight steel or aluminum frames, sturdy tires and more. One Touch Brakes – These brakes are easy to engage and disengage. One touch brakes work very quickly which is beneficial for added safety. Car Seat Compatible – This feature has a car seat that has a base that stays in the vehicle. You can put the baby in the car seat at home, carry the whole seat to the car and attach it to the stationary base that stays in the car. Then when you get to your destination, you move the car seat to the stroller and snap it onto the stroller. Trays for Child and Parent Trays – Trays that hold snacks, drinks and toys for the child are a preferable feature that you want to look for. The parent tray should have a place for one of two drinks as well as a place for keys or other valuables. Covered tray compartments are even better from a standpoint of avoiding the keys or wallet getting lost. Below the Seat Basket – This area is always helpful as this is where you put diaper bags, clothing, and anything else you need to store when you are walking or jogging with your child. Adjustable Handle – Height adjustable handles can be adjusted to parents of any height. Being able to adjust the handle according to how tall the parents are make it comfortable to push the stroller regardless of how tall or short the parents are. Stays Upright when Folded – There are some all terrain and regular strollers that can stand upright even when they are folded up. This is a convenient feature for when you are out running errands or going out to eat. You can fold up the stroller and sit it somewhere and it will take up less room than it would if you had to lay it down somewhere. The drawback to this feature is that the child can pull the stroller over onto themselves or it can just fall over on its own. Always strap the baby into the stroller – All strollers come with safety straps. Even if the baby isn’t going to be in the stroller for very long, you should have the harness fastened. It just takes seconds for the baby to fall out. Even if they are sleeping you should strap them in, in case the baby wakes up. Make sure that the harness is a 5 point harness so there is a strap that comes up between the child’s legs. This prevents them from being able to slide out underneath the strap. Use the Wheel Brakes – If the stroller is stopped, the stroller’s brakes should be engaged. Even on ground that appears to be flat, the stroller can roll quickly if you have your back turned even for a minute, or someone can bump it. By having the brakes engaged, the stroller isn’t going to roll anywhere. The best stroller wheel brakes are the ones that lock into place and not the ones that use pressure, which can wear out. Don’t Weigh the Stroller Down too Much – A lot of people will load down a stroller with things in the basket underneath, hung over the straps and even tucked in next to the child. Aside from putting a tremendous strain on the frame and wheels, this can also cause the stroller to become unstable and tip over. This is especially true with smaller strollers but it can happen with the all terrain strollers as well. Never Leave Your Child Unattended in the Stroller – Even if your child is sleeping in the stroller they should never be left unattended even for a few minutes. If the child should wake up and you’re not there, they could try to get out of the stroller and tip it over, injuring themselves. They can also be abducted if they are left in a stroller alone without adult supervision. Even if the stroller is inside, you should not leave them in it unless you are right there supervising them. That means don’t even leave the room for a few seconds to use the bathroom or get a drink. All terrain strollers are a great piece of baby equipment to get when you want to be able to take your child on walks and not have the terrain stop you. There are many choices on the market for all terrain strollers. We have provided detailed information on the top rated all terrain strollers in this review for you to compare and take a look at. When you have all the information you need such as features to look for and points to consider, you can make a decision that is not based on guesswork but on fact. You will feel confident that you have made the best choice for you and your child and have a terrific all terrain stroller that you can take anywhere.